For those of us who meticulously hand select specifically where we dine and drink when visiting a new city, we often don’t even take into account where a restaurant or bar actually is located. I happened to select Hugo’s, Feast, Anvil, and the Hay Merchant as destinations to visit. I had no idea that they not only were in the same neighborhood, a bit to the west of Downtown Houston, but they all were on the same street! Westheimer Road is a narrow, winding, pot hole ridden four lane road, that is far more important a thoroughfare than its appearance would make it seem. The roughly mile long stretch runs through the Montrose neighborhood of Houston. It’s residential everywhere with Downtown to the east, the Galleria and River Oaks to the west, and Rice University, Museum District, and the Medical Center District all to the south. The being sprawling Houston, nothing is walking distance. Especially in humid 98 degree heat. Fortunately, the residents only need this one street. Westheimer boasts one of the country’s most impressive, intensely concentrated stretches of important bars and restaurants. These are national headliners, not just Houston headliners. Beginning closest to Downtown, Feast might be the closest thing we have in the U.S. to Fergus Henderson’s extreme nose to tail, rustic English cooking at his London restaurants. 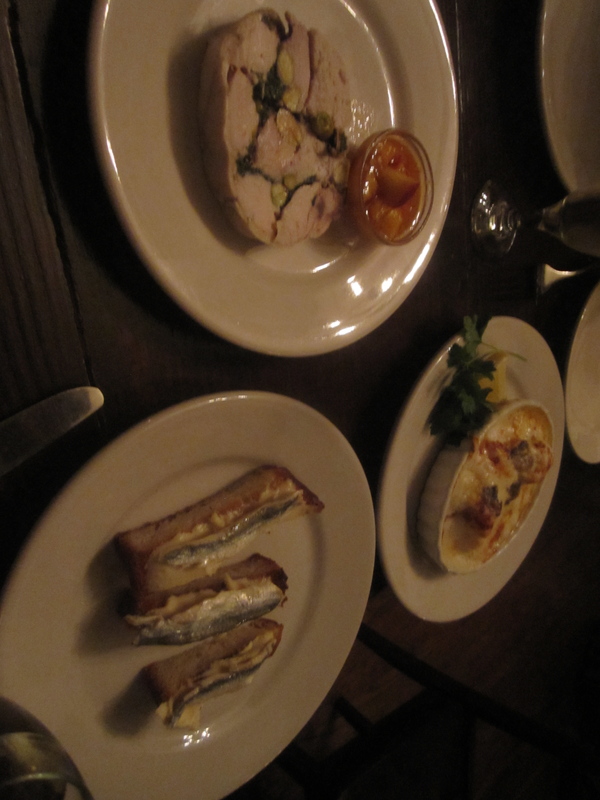 My dinner at Feast far exceeded any meal I’ve had at St. John, which seems to always fall to the hype and not escape its harsh sterile environs. Don’t come to Feast for a dietetic or nutritious evening. Yes, I’m looking at you, diners eating the herbed lentils with spinach and goat’s cheese. Here, you indulge in massive, tender sea scallops, baked gratin style with mushrooms in a brandy cream sauce. The scallops pair perfectly with a bone dry Fino sherry as the menu mentions. Go for beef heart and fennel sausages or fish and scallop pie topped with a leek and cheese crusted mash. 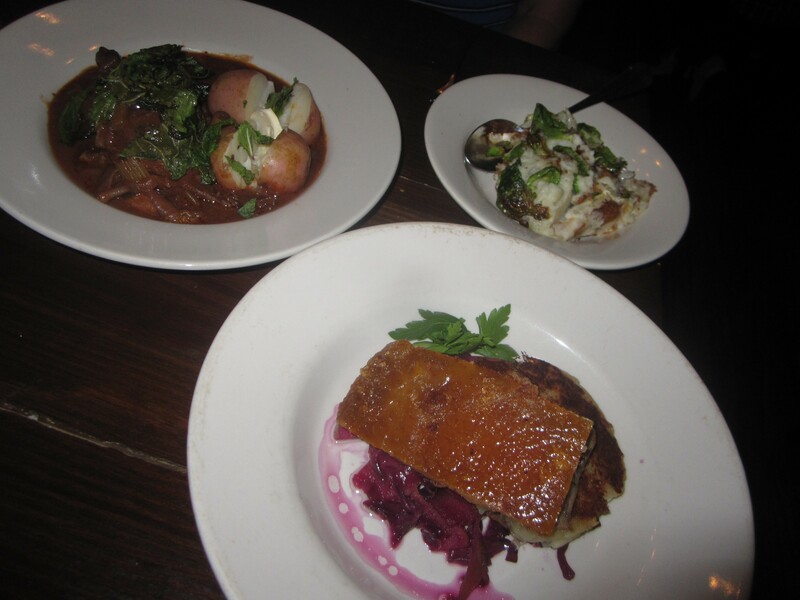 Yes, the bubble and squeak was dull, the coq au vin came with hopelessly plain and superfluous red potatoes, and the chicken galatine (cold meat rolled around pistachios and chicken mousse, with a side of peach chutney) managed to be both unexciting and the breast meat dry. The sensationally tender and moist pork belly suffered from its gargantuan serving. It would tremendously benefit by being cut in half and served as a starter, not a ridiculously rich and mammoth sized entree meant for the 3 am college crowd. It is a dish that epitomizes excessive gluttony. However, I’m still torn who was the ultimate winner. Service is spot on and the Victorian town house setting makes you want to linger with another glass of Fino sherry. But wow that sticky toffee pudding and the small Exmoor toasts with clotted cream and sardines are breathtaking. The showstopper is the re-invention of coq au vin, though. With strong barbeque accents, this is a classic French dish with a Texan twist through the eyes of an English chef. Worlds collide and thrive in this rendition. Continuing west along Westheimer past the old fashioned, romantic Italian standard Michaelangelo’s, Indika serves a contemporary take on Indian cuisine. Think kale and blueberry salad with spiced cashews, heirloom tomatoes, and sprouted lentils, or Texas antelope chop in a curry of morel and oyster mushrooms, finished with a dash of Old Monk dark rum. Montrose is very much like what you might find in Eastern Portland or Seattle, where for some strange reason (real estate costs…) the densest collection of worthwhile restaurants in the city are not in Downtown, but amidst vintage clothing stores, salons, and yoga studios. Yes, the word “hipster” pops into your mind everywhere in these types of neighborhoods. 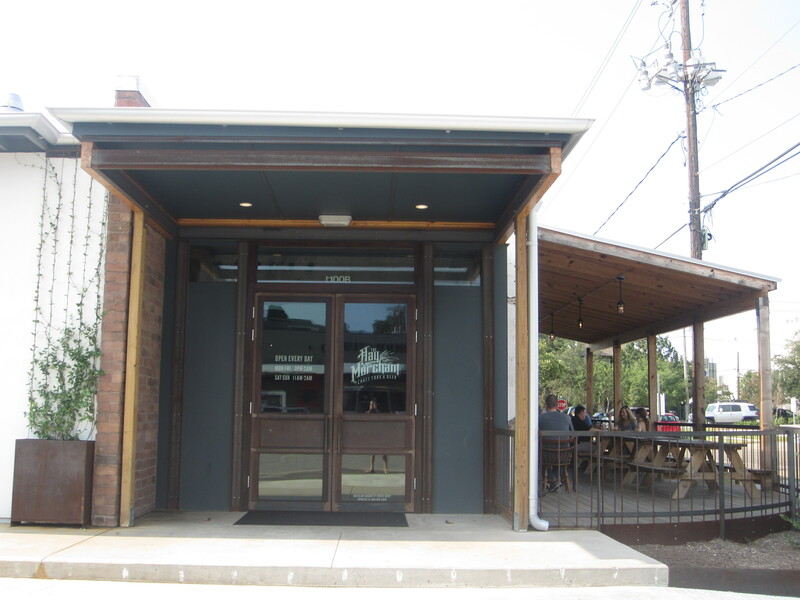 There may be no “third wave” coffee cafe on Westheimer. However, Indika does have a yoga studio above the restaurant. No caffeine, but there is yoga to be found here. Past Indika, the intersection of Westheimer with Montrose Boulevard is the center of this stretch. Here, Tyson Cole has opened the first non Austin outpost of his emerging innovative take on Japanese cuisine Uchi empire (stay tuned next week for a review of the phenomenal Uchiko). Bryan Caswell, the chef at Reef and arguably the city’s biggest name chef thanks to “Iron Chef” has opened a sliders restaurant called Little Big’s. There is a Little Big’s also at Minute Maid Park, home of the Astros. Unfortunately my samples of the sliders there were as exciting as the Astros season has been (they are 40-88 at the moment). Caswell’s Tex-Mex cafe, El Real, is one block west along Westheimer. His upscale flagship, Reef, is in the Midtown neighborhood of Houston, closer to Downtown (stay tuned for a review there…). 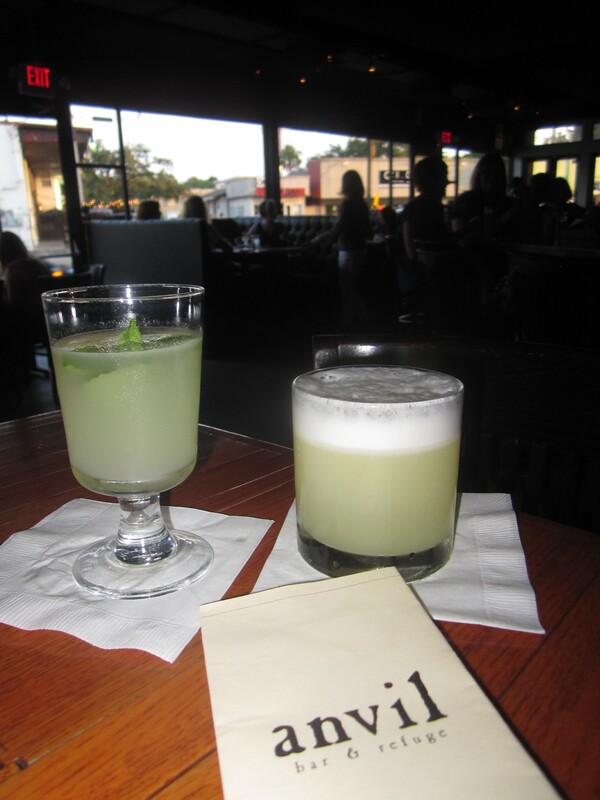 Across from El Real is the new 1-2 punch from the folks behind Anvil Bar & Refuge, just down Westheimer. Underbelly’s small plates and strong wine list have made it the hottest opening of the summer in town. Next door is the new 80 tap strong beer bar, The Hay Merchant. Grab a warm, soft pretzel, and have your mind boggled by the extensive beer choices. Why not go local with the excellent Buffalo Bayou 1836 Copper Ale? You’ll thank me. 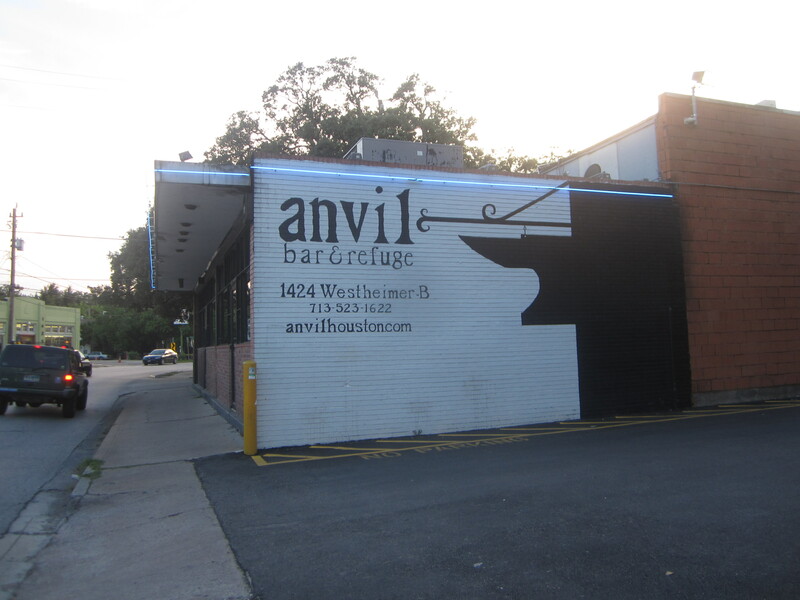 Speaking of Anvil, one of the country’s foremost craft cocktails bars that shakes and stirs masterpiece after masterpiece in a very grown up yet comfortable ambiance, resides at the corner of Windsor and Westheimer. Prepare to wait for a seat and a drink after 6 pm. Drinks such as Pliny’s Tonic, a Oaxacan Sour, or The Brave are always worth it. A curve in Westheimer leads you to the final part of the stretch with The Poison Girl bar (it’s not easy being a cocktail bar near Anvil…), Mark’s American Cuisine (one of the first to bring New American, farm to table dining to Houston back in 1997), and one of the country’s most exciting Mexican restaurants, Hugo’s. Hugo Ortega’s elaborate menu is of the type where it’s impossible to choose, but if you throw a dart randomly at the menu, you’ll love whatever dish it lands on. 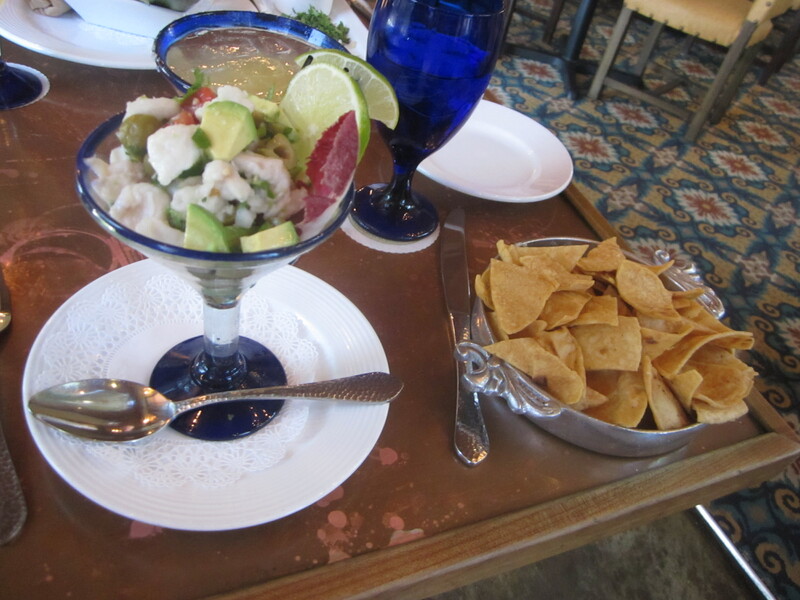 Ceviche here is brilliant, full of Manzanilla olives, tomatillo, cilantro, and Serrano peppers. Don’t skip the achiote rubbed suckling pig tacos with a fiery habanero salsa and be daring with the crunchy grasshoppers, turned into tacos with the superb guacamole. 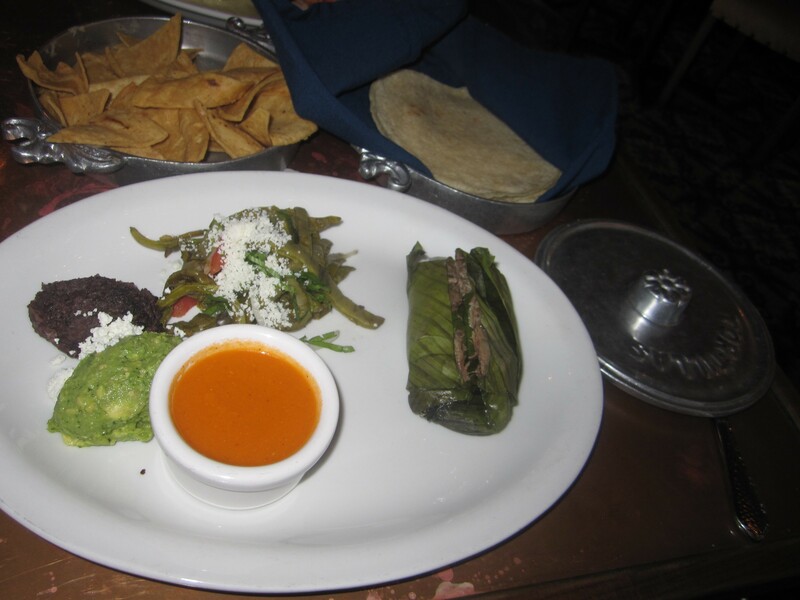 This would be the place that changes your mind on chiles rellenos, here served in two styles: one with a green salsa and roasted chicken, the other a red carne guisado (beef-red chile stew). Best would be the slow braised and roasted meats, in particular goat meat served in a banana leaf, with warm flour tortillas, and a fascinating charred side of cactus. That cactus is a revelation. 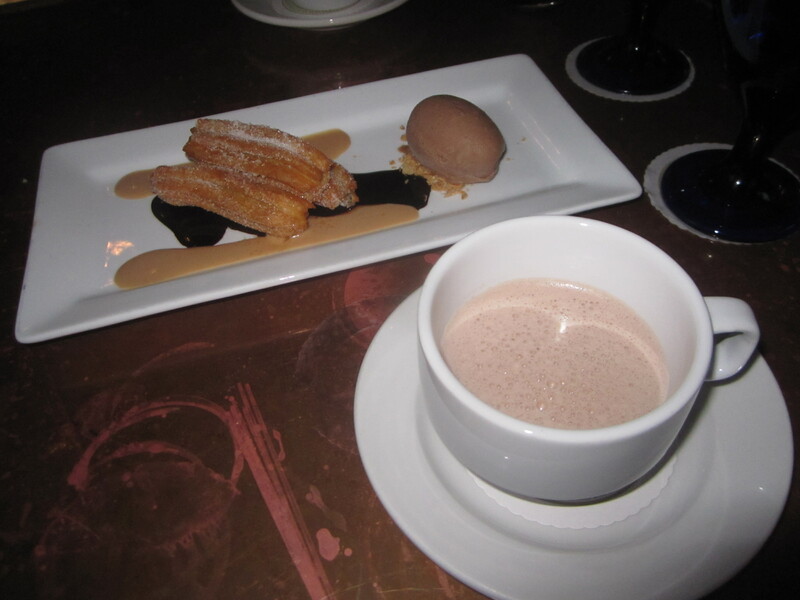 Finish with anything featuring Ortega’s homemade chocolate: hot chocolate, chocolate chipotle cake, anything. Strangely the otherwise terrific churros were not filled with the promised dulce de leche. That was the only faux pas, aside from a special Margarita that was supposed to be a step above the regular “Hugo-Rita,” with Grand Marnier and a top shelf reposado tequila. It turned out to be bland. There is no way that Grand Marnier was added to the drink. I sure wouldn’t mind having Hugo’s around the block from my house. 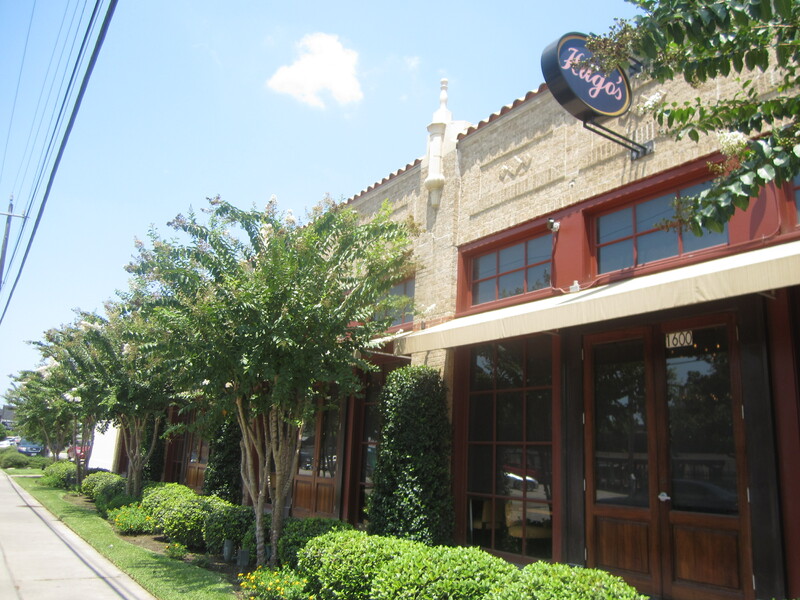 Or Anvil or Uchi or Feast…but in Montrose on this stretch of Westheimer, the residents are lucky to have all of these excellent places to eat and drink, on one street. 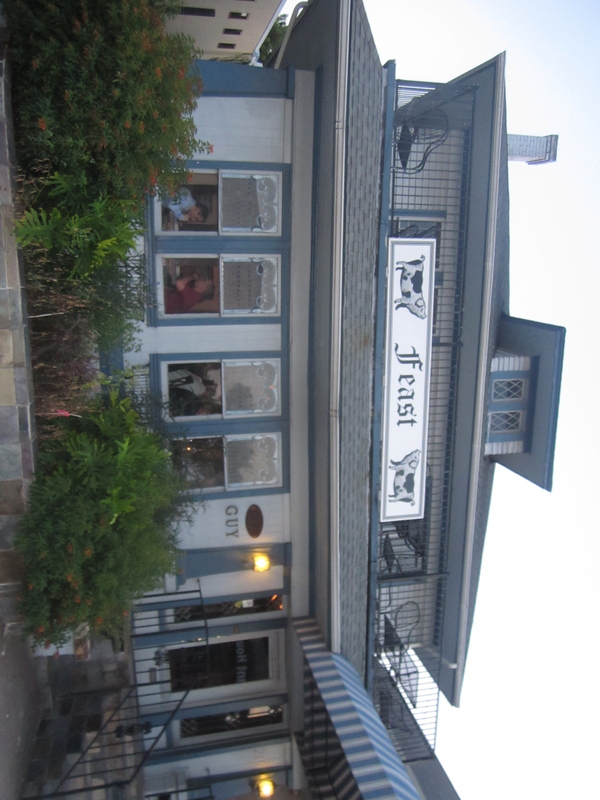 This entry was posted on August 27, 2012 by trevsbistro. It was filed under Cities, Houston, Neighborhood of the Week .